Schedule your next service online with us! Welcome to The Car Doctor. The Car Doctor isn’t your typical full-service auto repair shop. We've been part of the Northern Virginia and Falls Church community for over 30 years. For years, we have taken pride in giving you the best possible customer service in a modern, well-equipped auto repair shop. That same kind of service pride continues today. We specialize in repairing both foreign and domestic cars. Our ASE Certified Automotive Technicians will work with you and assure unmatched customer satisfaction. Our waiting area is comfortable too. You can even sit inside or outside and enjoy a fresh cup of coffee, and use our free Wi-Fi while you wait. 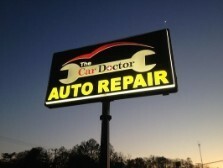 There's no other doctor in town that can beat us when it comes to servicing your vehicle. From simple oil changes to replacing your transmission, we can do it all. When you visit us, you'll rest assured that your vehicle will be repaired right - the first time. Please contact us for more information about our repair and maintenance services. We are located at 7714 Lee Highway, Falls Church, VA 22042. Please call us at 703-454-5199 to set up an appointment or click here. You can also get driving directions and hours of service from our user friendly website.